The phrase “whether or not” should set off a mental alarm. Consider the opportunity cost of making such a decision. What else could you do with the same time and money? Perform a Vanishing Options test. That is, imagine you can’t choose any of the options you’re considering, what else could you do? Necessity is the mother of invention. Cultivate multiple options at the same time or find someone who’s solved your problem. Consider the opposite of your assumption or position in a situation. Ask yourself what would have to be true for every option to be the very best choice. Ask disconfirming questions. Zoom out and zoom in. Factor in statistics, base rates, and averages. If you can’t find numbers, consult an expert. Get on the ground floor with the troops. Perform small experiments to gather more information. This will help test your assumptions. Perform a 10/10/10 analysis. That is, ask yourself how you’d feed about a particular decision 10 minutes from now, 10 days from now, and 10 years from now. What would you tell your best friend to do in this situation? 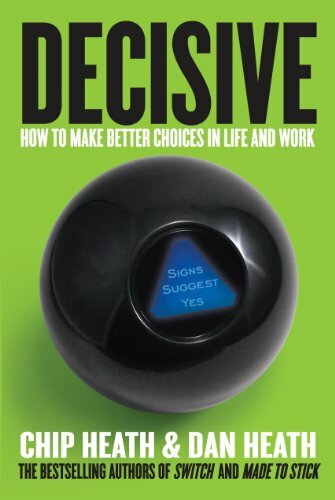 Note that agonizing decisions are often a sign of conflict among your core priorities. Do a premortem - consider you failed, how did it happen? Perform a Failure Mode and Effect Analysis (FMEA). This analysis is where team members identify what could go wrong at every step of their plans and for each potential failure they ask “how likely is it?” and “how severe would the consequences be?”. After assigning a score from 1 to 10 for each question, they multiply the two numbers to get a total. The highest totals gets the most attention. Consider you succeeded and there’s a parade in your honor. How do you ensure that you’re ready for it? Assume you’re being overconfident and give yourself a healthy margin of error. Use prospective hindsight in order to work backward from a certain future which will make you better at generating explanations for why the event might happen. Set a tripwire like a deadline or partition (like budgeting x dollars for some project). This has the effect of putting an upper bound on risk.